IBASSIN: Chris Johnston Wins the 2018 FLW Tour Harris Chain Tournament with 79-06lbs! Chris Johnston Wins the 2018 FLW Tour Harris Chain Tournament with 79-06lbs! Johnston with help from buddy Gustafson claims first win! There might be no better rivalry in international sports than that of the U.S. versus Canada. And this week, we’ve seen two showdowns between the friendly border nations that ended in dramatic fashion. First, it was the U.S. women’s hockey team defeating Canada in an overtime gold-medal game that ended early Friday morning at the 2018 Winter Olympics. 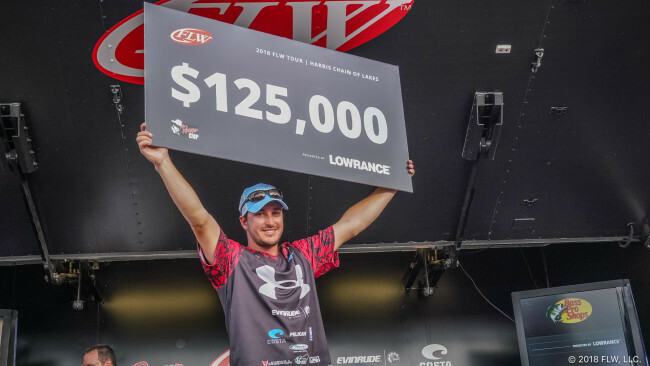 Sunday, it was Team Canada taking the first- and second-place spots at the end of a wild day of fishing that saw several lead changes at the FLW Tour event presented by Lowrance on the Harris Chain. When it was settled, Ontario’s Chris Johnston stood atop the podium for his first FLW Tour win with a four-day total of 79 pounds, 6 ounces. Johnston edged out his friend and countryman Jeff “Gussy” Gustafson by 2 pounds, 6 ounces. While each pro’s finish was the result of stellar individual effort, Johnston was quick to offer thanks to his friend for an assist that ultimately helped him earn the win. Both Johnston and Gussy keyed on offshore hydrilla in Lake Harris throughout the week. At one point, Gussy located a flat where some fish were schooling on the surface. He caught a 5-pounder and called Johnston over to join him on the spot. While Johnston didn’t catch any key fish from the spot that day, he kept it in mind for later in the week, and the spot wound up being a critical stopping place for him. “I really owe Gussy a big one because he’s the one who said ‘come on over,’ and it’s where I caught almost all my keepers today,” Johnston says. Johnston began his tournament in Lake Griffin on day one. Getting to Griffin requires traveling through long idle-only zones and navigating a lock, so it burns nearly two hours of fishing time, but he had a late check-in time that day. In Griffin, Johnston used a prop bait, Zoom UV Speed Worm and vibrating jig to catch three of his weigh-in keepers – mostly spawners – before returning to Harris to finish out the day offshore. That day he weighed in weighed 19-13. On day two, with his boat number reversed and an early check-in, Johnston ditched the morning commute and stayed in Harris at a spot just two minutes from the takeoff site at Venetian Gardens in Leesburg. He fished a hydrilla edge in about 12 feet of water where bass were foraging around a shad spawn. The shad were piled into a 100-yard-long indention in the edge of the grass, and Johnston worked on them with a jerkbait and a gold lipless crankbait. The jerkbait was his preferred bait, but he says the bigger fish were hanging down below the fray of shad, feeding on white bass and smaller black bass. The lipless bait was a better tool to get down to them. He fished it with a yo-yoing retrieve, letting it go to the bottom and ripping it up. An 8-6 caught on the lipless anchored a 25-7 day-two bag that was the biggest of the tournament and set up Johnston’s win. He went into the weekend in first place. Most of his day-two limit came very early in the morning, as a flurry of activity lasted until about 9:30. On day three, the flurry lasted only until 8:15, and then Johnston suffered a six-hour lag between keeper bites. That’s when he made the first clutch visit to the spot Gussy showed him. At 3 p.m., he pulled in as the school started to fire and was able to catch two critical keepers and cull up to 16-12 to retain his lead. “There were quite a few fish in the area. I wish I’d had another 20 minutes,” Johnston said that evening. On the final day, the morning flurry lasted just 30 minutes. He went back to the schooling spot for the second time. There were sweet spots on the flat, but they weren’t obvious. While other pros reported targeting holes or edges in hydrilla flats around Harris, Johnston could only find the key spots on the schooling flat by fishing or by spotting white bass busting bait on the surface. The largemouths were mixed in. Gussy actually located the schoolers earlier in the week when he spotted birds crashing on the bait. Johnston’s first flurry on the schooling spot – the one that produced his cull fish – didn’t last long. He then bounced around to several other similar areas with little success and eventually came back to the flat once more midday. It would be the last successful stop he’d make all day long. The fish was his best of the day and ate a custom white vibrating jig with a Jackall Rhythm Wave 4.8 swimbait as the trailer. Johnston spent the rest of the afternoon bouncing around here and there, hoping for one more kicker that would never come. But he wound up not needing it. Thanks to the giant stringer of day two, a couple of morning flurries on his offshore shad spawn spot and a key tip from a friend, Johnston was able to outlast anything the competition could muster and will take the FLW Tour Harris Chain champion’s trophy home to Canada.